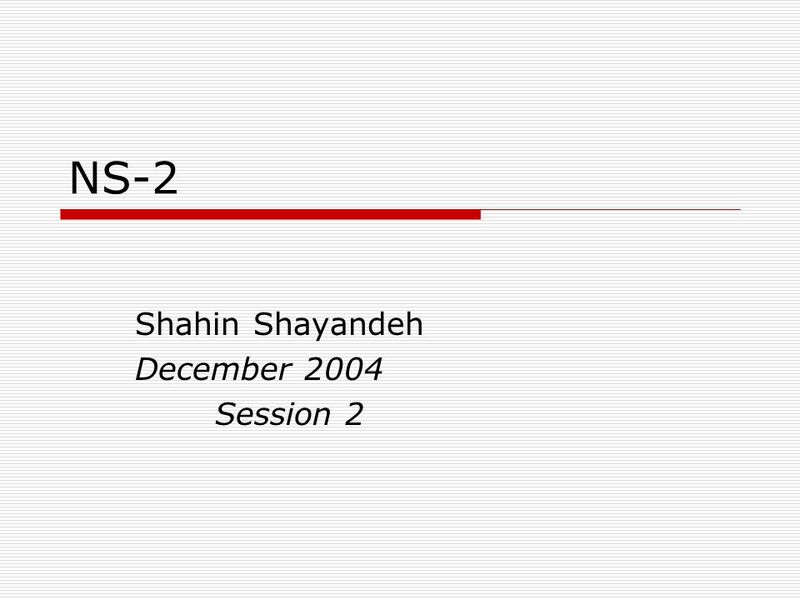 NS-2 Shahin Shayandeh December 2004 Session 2. 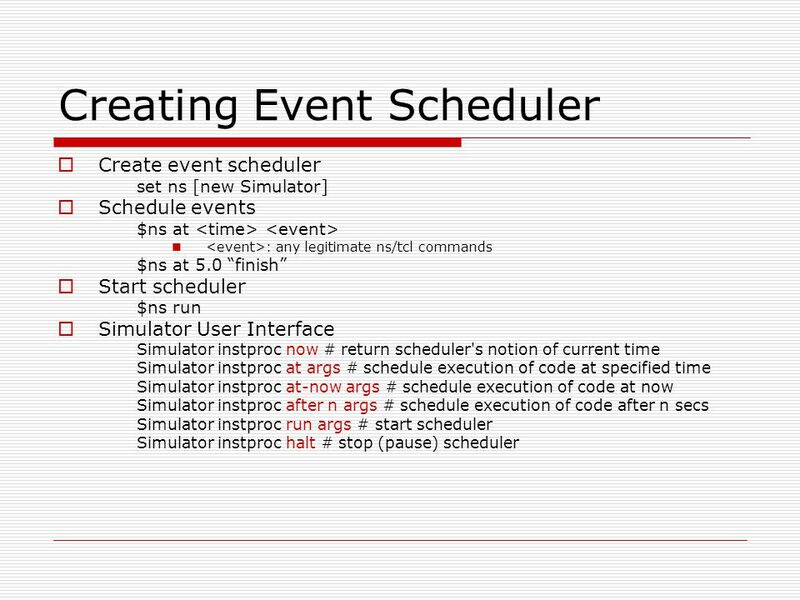 Ns programming  Create the event scheduler  Turn on tracing  Create network  Setup routing  Insert. 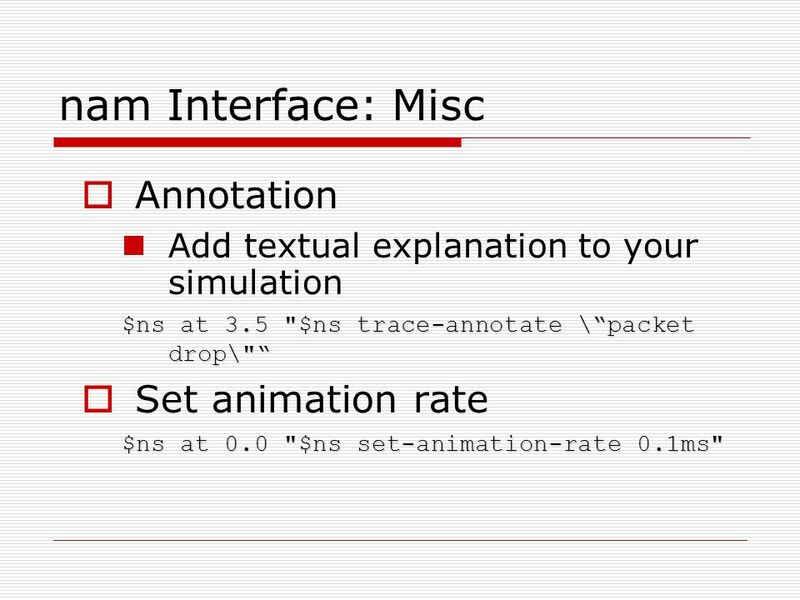 18 nam Interface: Misc  Annotation Add textual explanation to your simulation $ns at 3.5 "$ns trace-annotate \“packet drop\"“  Set animation rate $ns at 0.0 "$ns set-animation-rate 0.1ms"
Download ppt "NS-2 Shahin Shayandeh December 2004 Session 2. 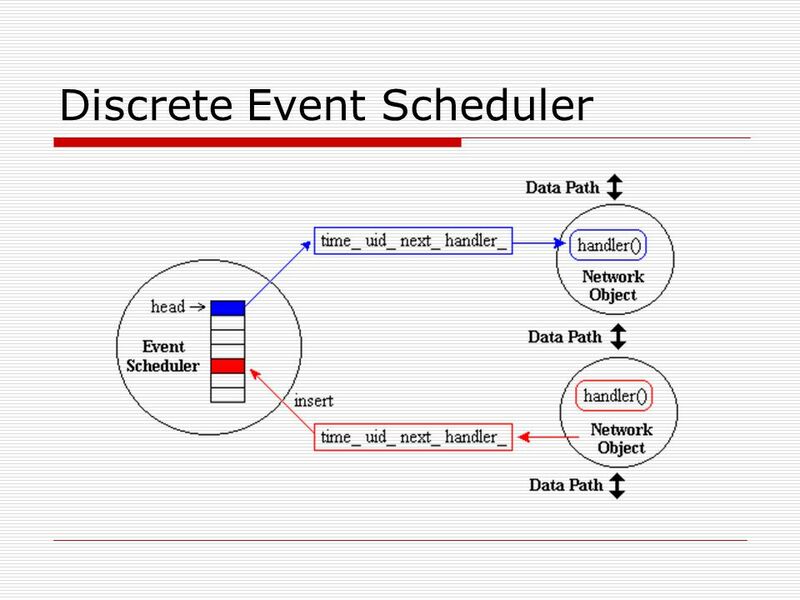 Ns programming  Create the event scheduler  Turn on tracing  Create network  Setup routing  Insert." 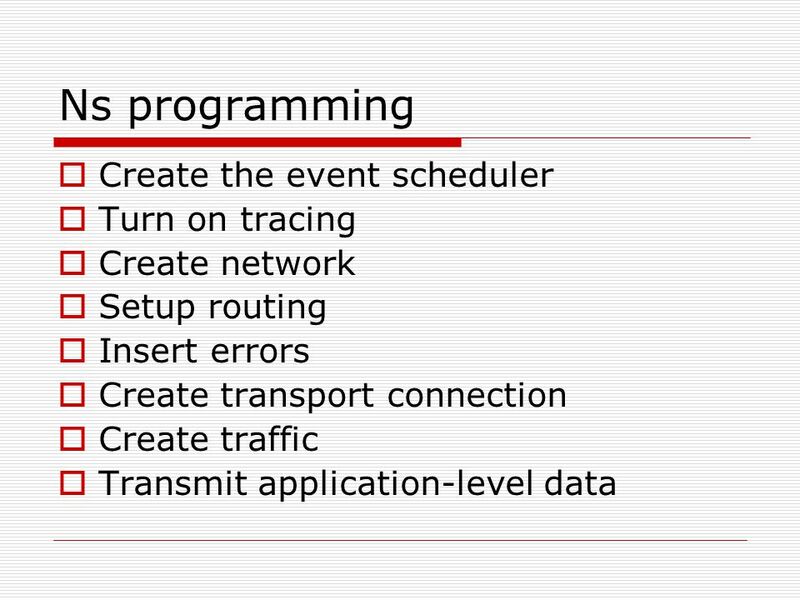 Network Simulator and problems in installing. 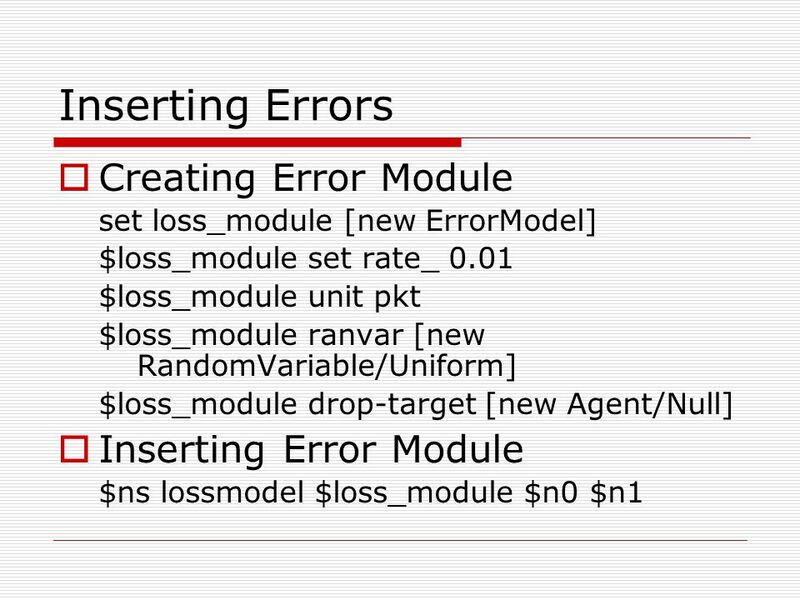 Introduction Problems in installing Wired networks modified example2.tcl commands in OTcl usual problems. 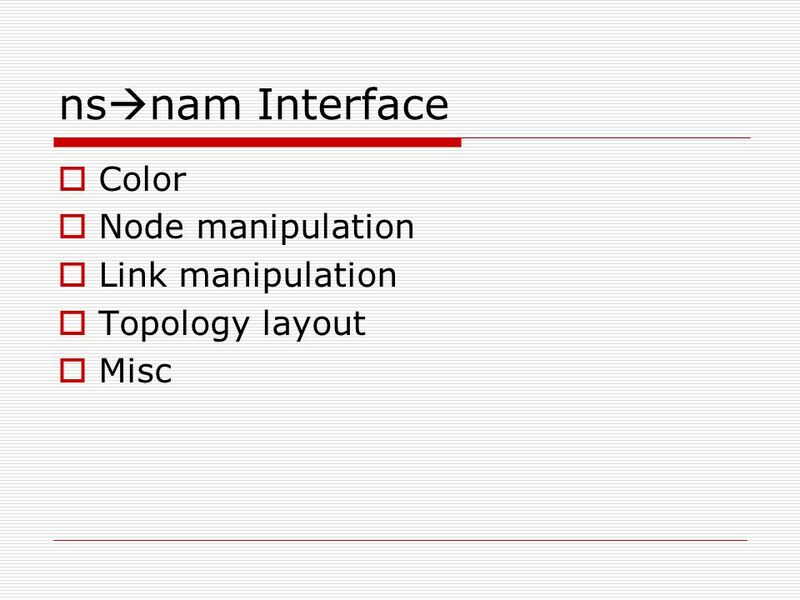 Introduction to nam Tim Buchheim 21 November 2002 ns tutorial - fall 2002. Katz, Stoica F04 EECS 122 Introduction to Computer Networks (Fall 2004) Network simulator 2 (ns-2) Department of Electrical Engineering and Computer Sciences. 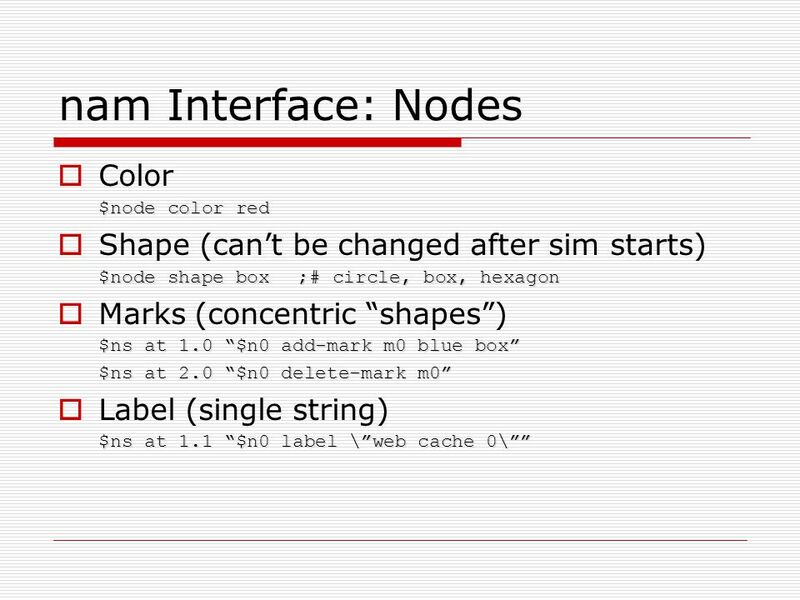 NS2 Tutorial – Part II Internet Computing KUT Youn-Hee Han. 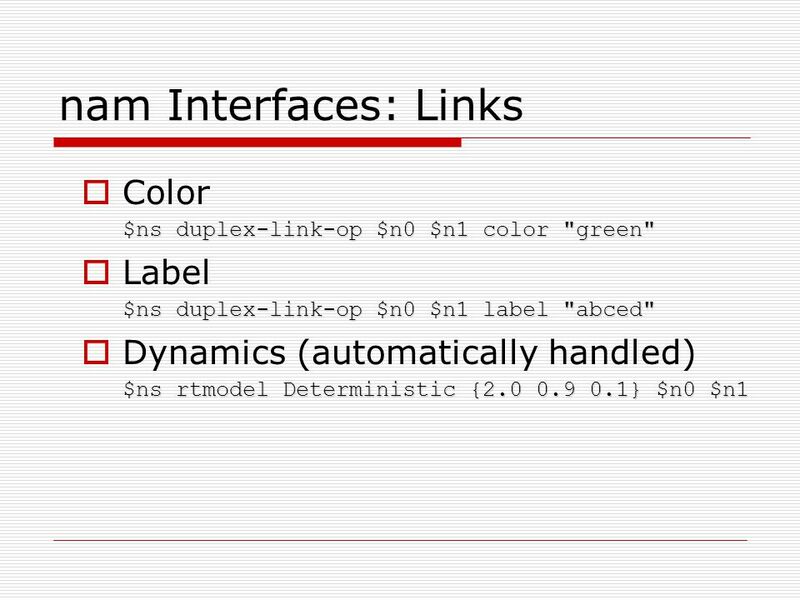 1 Multicast in ns-2 報告者 : 陳沐恩. 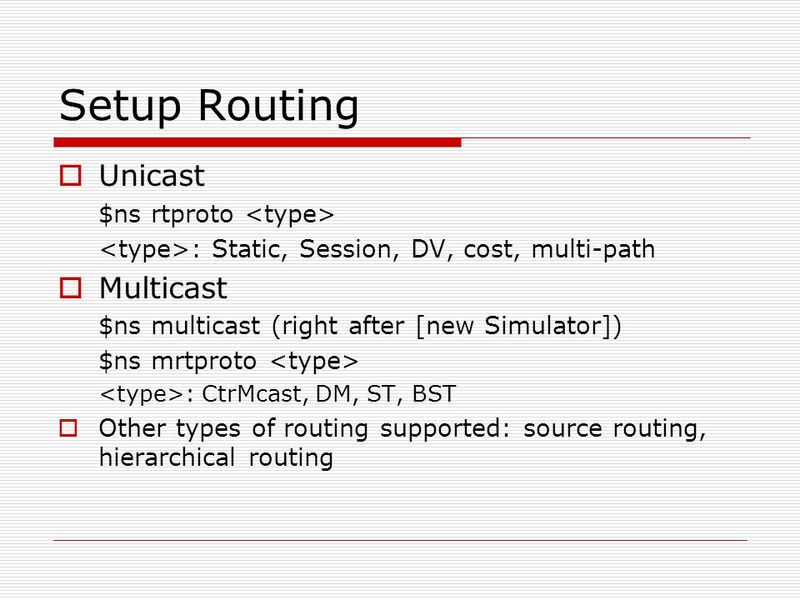 2 Multicast 簡介 3 Multicast Routing set ns [new Simulator] $ns multicast Or set ns [new Simulator – multicast on] set mproto. 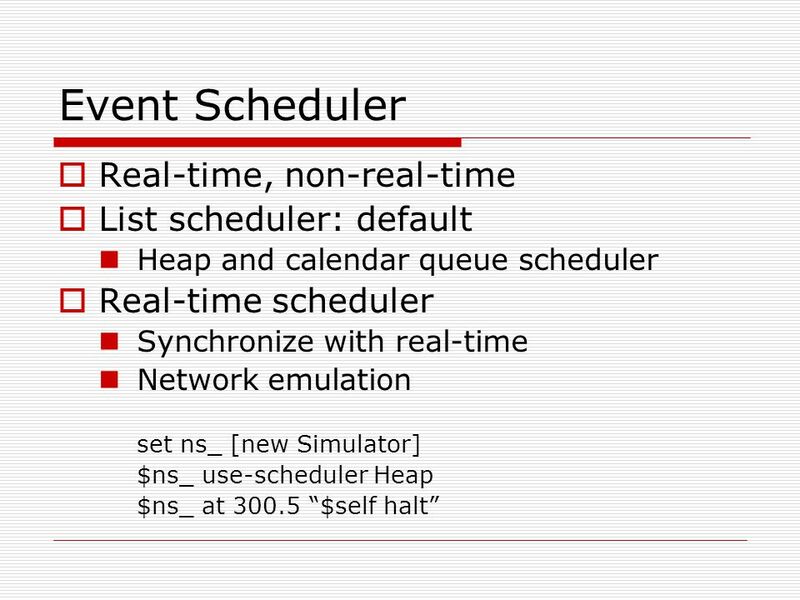 NS-2 (network simulator) NS by example παρουσίαση Κων/νος Τρούλος. NS2-TCP Internet Computing KUT ( Youn-Hee Han It is licensed under a Creative Commons Attribution. 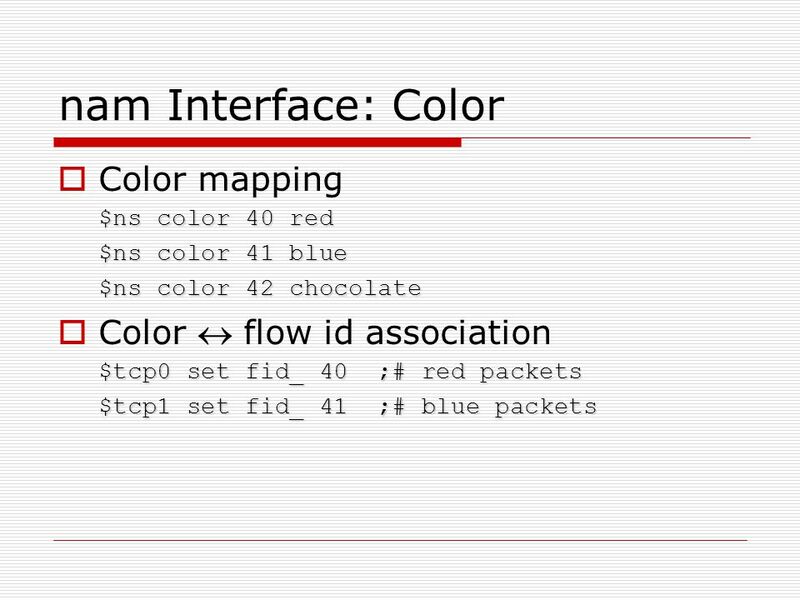 Wireless and Mobile Computing Simulations Lecture 27. 1 NS Fundamentals (contd..) Padma Haldar USC/ISI. 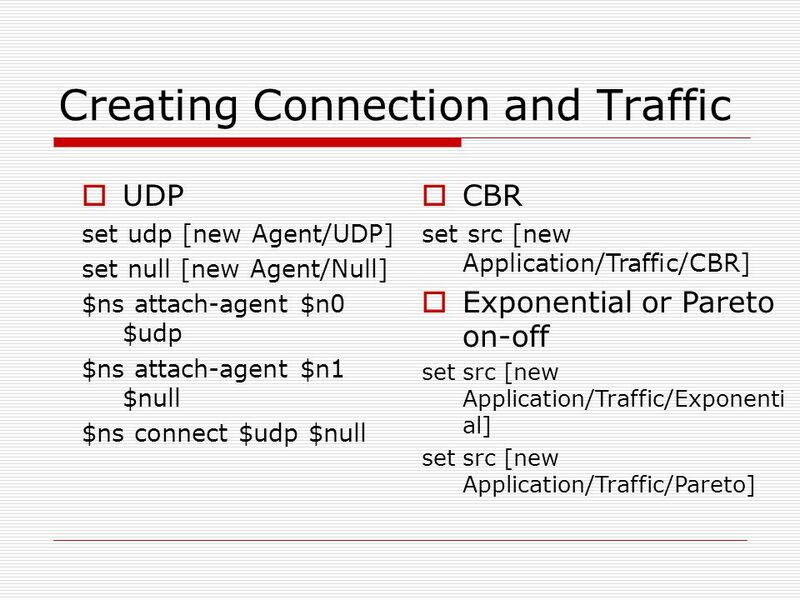 An Introduction to NS-2 * Gayatri Swamynathan CS 276 TA *some slides are from a presentation by Haobo Yu & Nader Salehi, USC/ISI. 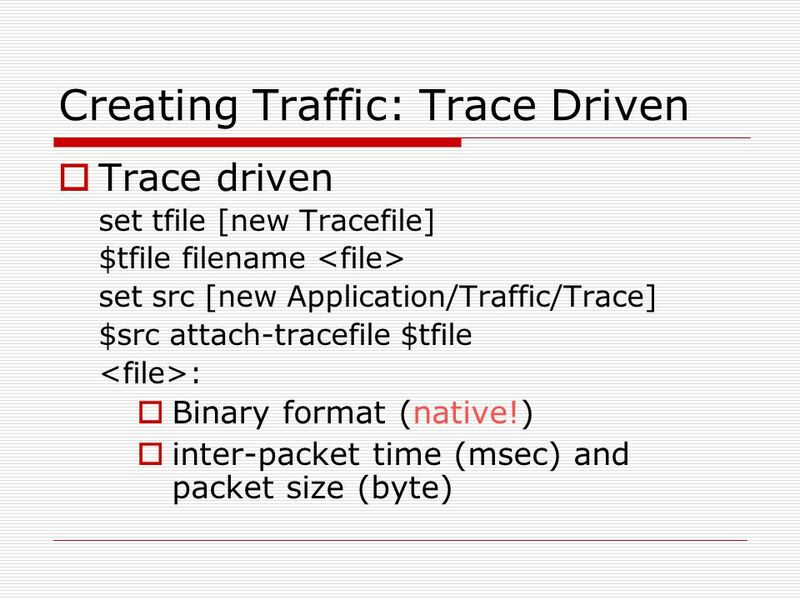 Ns-2 tutorial Karthik Sadasivam Banuprasad Samudrala CSCI 5931 Network Security Instructor : Dr. T. Andrew Yang. 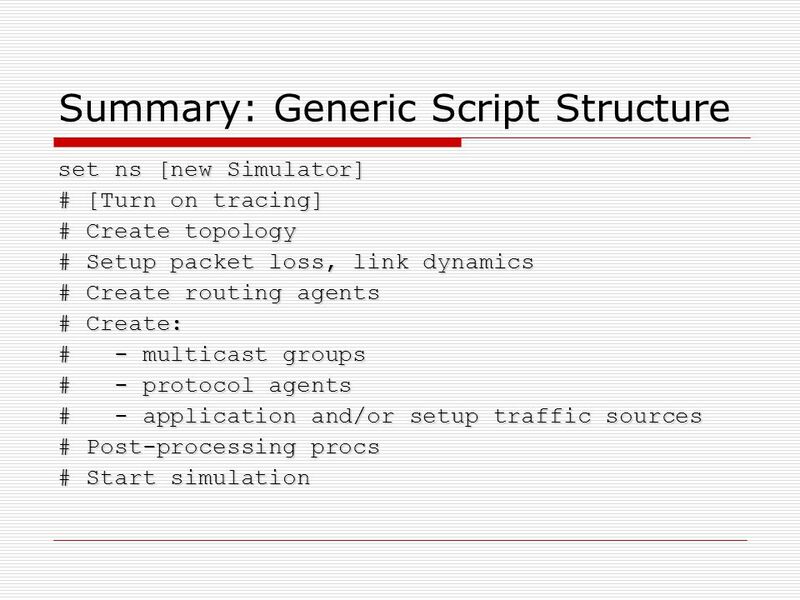 Network Simulator (NS) Prof. Nelson L. S. da Fonseca State University of Campinas, Brazil. 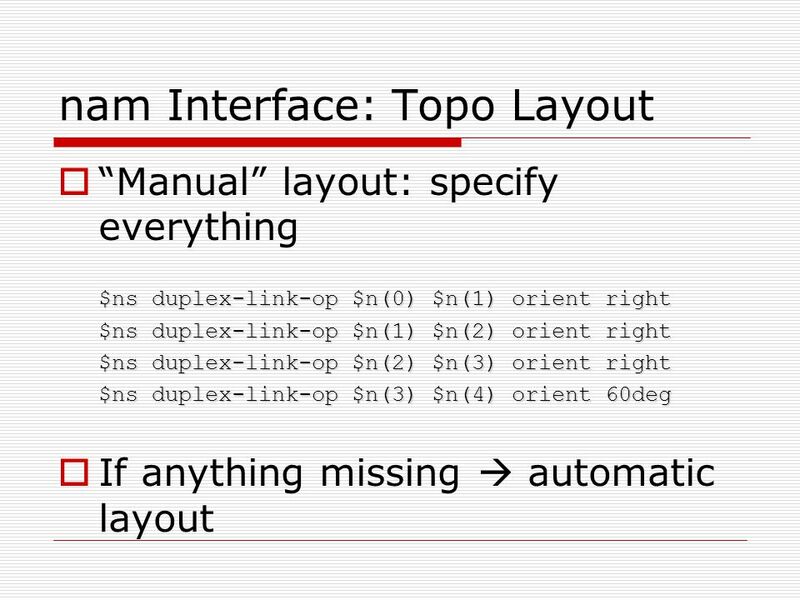 How to Add a New Protocol in NS2 Xu Leiming CSCW Lab. at CS Dept., Tsinghua Univ. June 1, 2001.